I know. To do a rock musical / opera about Dracula in 2015 is about as hot as a fridge in the North Pole. Also, the whole vampire subject feels really watered down with all the vampire related TV-series like True Blood and The Vampire Diaries and movies such as the Twilight saga that’s been shoved down our throats in recent years, there has been a vampire overload to put it mildly. I’m not gonna lie to you, I think True Blood is really great and I do have a soft spot for vampires, but for me, it’s the classics that rules. I thought Bram Stoker’s Dracula (which lies as a groundwork for this project) was bloody amazing. I know that there are smirks on people’s faces about this album and its concept and I can understand that, but on the other hand, if you’re gonna do a musical about Count Dracula, isn’t the format of hard rock really the ultimate genre to do it in? I think so. Norwegian singer Jorn Lande is a really great vocalist and his Ronnie James Dio / David Coverdale influenced set of pipes gives me a good feeling about this project as I believe he could fit perfectly as the part of Dracula. But what puzzles me a bit is that Jorn, just a few years ago said he would turn down all offers to do outside projects – like Avantasia and Ayreon that he turned down – to concentrate on his own band Jorn and now this project comes along not long after the fourth release of the latest Allen / Lande album. Well, together with ex – Wig Wam guitarist / songwriter Trond Holter, Jorn has written and recorded this little rock opera. What I find really cool about this story is that instead of just going on and on about Dracula going out on his killing sprees and blood sucking trips, the pair has focused on Dracula, the person, what made him tick, how he feels and why he turned out the way he did and how his search for true love made him not want to give up eternity. With this knowledge, I found this project more interesting and with a few snippets of music from this album that could be found online, I actually had my hopes up for this album. Because, to be honest, Jorn Lande is a brilliant singer and his voice has brought joy to many projects such as Masterplan, Ayreon, Avantasia, Allen/Lande and Vagabond (a band he formed in 1994 with former TNT members, guitarist Ronni Le Tekro and bassist Morty Black), but his own band has been more or less mediocre and dull. Lande’s strength is not in song writing, his strength is to put his fantastic voice over fantastic songs written by other people. And that is what worried me a bit about this album – that Jorn himself would be the songwriter on this album. On the other hand, I had always liked Wig Wam very much and Trond Holter did co-write their songs so maybe he would make the songs for this project lift. On the other hand again, Holter is now Lande’s right hand in Jorn and together they wrote five songs Jorn’s last album Traveller (2013), an album that didn’t convince me one bit. But – and this is important – this is not a Jorn album, this something completely new and not limited to sound like a Jorn album. Pre-dating the album was the release of a single / video, a song called “Walking On Water” was chosen as the leading track for this record and in my book, this was a trial by fire. Had the song come out sounding like just another Jorn-track, I’m not sure if I would have even bothered with this record at all. I was also hoping for a real cool video to accompany the song. Well, the video turned out to be a real low-budget deal and a real disappointment. Look, I don’t think videos are that important normally, but if you’re gonna sell a rock opera, then the leading track has to have a video that follows through. This didn’t. I know videos might be expensive, but a half arsed video won’t cut it if you’re gonna sell a musical with it. Luckily enough, the song itself was anything but low-budget. It’s a strong 70’s based hard rocker with a huge Deep Purple influence, not a far cry from what Jorn usually does, but this one has a distinct melody throughout the whole song that really sticks and the chorus is really kicking. The guitar solo takes a real cool celtic Gary Moore / Thin Lizzy turn which makes the song stand out – brilliant! The opener “Hands Of Your God” sounds like a 70’s hard rock version of Blackmore’s Night (without the female vocals) and after another spin of “Walking On Water” that follows, expectations for the rest of the CD is sky-high. The title track is epic and a little masterpiece in itself. It starts off with a cabaret-like piece that makes me think of old silent films. But the song soon turns into a 70’s Alice Cooper meets Queen rocker with more celtic guitar influences and I love that the song takes unpredictable turns – way to go! “Save Me” has some metal riffing and some mean vocals from Jorn. The song also has clear musical vibes and we also get acquainted with female lead singer Lena Fløitmoen Børresen for the first time as she duets with Jorn here. I might have to add that Jorn plays the part of Dracula and Lena plays Dracula’s love Mina. Lena Fløitmoen Børresen has a fantastic voice, a broad range and she is very charismatic. Their duet continues on “River Of Tears”, a tune that sounds like a 70’s hard rock version of Wig Wam where Holter’s clear love for the celtic melodies shines once again. “Into The Dark” is an epic, dark and heavy piece with evil written all over it, with Lena’s fateful sounding voice in sharp contrast to Jorn’s black vocal chords – brilliant! Closing track “Under The Gun” sounds like a more hard rocking version of Wig Wam. The hooks makes the whole song catchy and sticks to your brain like glue. It’s a great way to close the album because the song makes you want to put the album on repeat. 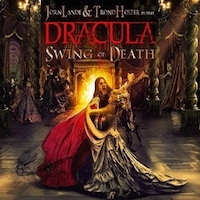 Even though I can appreciate and respect the fact that Jorn and Trond wanted to make this album a personal one that put focus on Dracula’s thoughts and feelings instead of bringing up the same old story that we have seen on the screen many times, I still get the feeling that this project could have been so much bigger. I know, Lande and Holter has probably made this thing exactly the way they wanted, but I can’t help to feel something is missing. Story wise, that is, because musically, this album is fantastic! But the whole rock opera / musical thing comes to a halt when you consider that this album is just a collection of songs. No narration, no intros, nothing in between songs at all. That makes this just as much a rock opera as Kiss’ The Elder, Queensrÿche’s Operation : Mindcrime or Iron Maiden’s Seventh Son Of A Seventh Son. This is more a theme album than a musical or opera, I’m afraid. I think it’s a bit of a downer that when someone finally has the guts to make an album about Dracula, there are just two parts (Dracula and Mina) and only ten songs, of which one is an instrumental. In my book, it takes the edge of things a bit and that takes one point of the final rating. But the music is awesome. It’s easily the best album that Jorn has ever co-written and it makes me wish for a whole new band featuring Holter and Lande. Yes, they play together in Jorn, but there they are limited by the concept of Jorn – at least that’s what it sounds like. A whole new band, with a new rhythm section and a new name could be so cool. The more pop oriented – Wig Wam-ish – melodies combined with the celtic influences of Holter and the whole Dio / Sabbath / Rainbow / Whitesnake vibe of Lande could make for a really happening band. Well, no matter how much an opera this is – or isn’t, it’s still a collection of killer songs and as an album I’d recommend this to anyone with a taste for heavy, but melodic hard rock with its feet in the 70’s / early 80’s.